Wow. I am impressed! I’d like to know the name of the store so I can patronize them! Why don’t you just mind your own business? Buy what you want. People could ridicule you for being willing to buy medicines that do actual harm to your body. Ever notice that the cautions in pharmaceutical commercials take up most of the commercials? Ask a pharmacist how those work. Do you think they will explain it on a molecular level? I know you probably think that homeopathics are just placebos. I don’t care what you think. If that placebo is so consistent that even being aware of the claims that it is a placebo, it still works the same every time, year after year, that’s fine with me. The condition improves with no side effects, and at little cost, so I’ll take that “placebo” every time. OK, so anyone should be just free to sell whatever they like, making any claim they like about what it does, and it’s entirely up to the consumer to sort out what’s true, and what’s a lie intended to entice you to buy something that won’t do you any good. Got it. Thanks for clearing that up. yikes! Even if someone receives a placebo effect from something, it is still a false claim that said object healed you. It didn’t. The placebo effect did, and that is what should be advertised. You don’t care what he thinks, but somehow you think he cares what you think. I think you misunderstand what a placebo is. It does not actually do anything. It just fools you into thinking it is doing something. While I’m 100% on-board with banning pharmaceutical advertisements, those warnings are there because actual science has been done to determine that they work and to determine any side-effects… something that doesn’t get done for so-called “natural” remedies (which homoeopathy isn’t, by the way). Ask a pharmacist how actual medicine works, and I guarantee they will be able to provide an actual answer. This is what their education is all about. Gotta love yer brass yikes. Bigging up homeopathy quackery on a story about how quackery really is quackery. The problem with this nonsense is that people are making large amounts of money through deception and that governments have representatives who advocate for stuff of this ilk being allowed by health insurance and maybe even taught at learned institutions. It isn’t harmless. There are “effects” from using unproven treatments when the proven ones are available. These include the watering down of herd immunity by the nefarious activities of “anti-vaxers” and the like which are causing outbreaks of whooping cough and measles that can have serious outcomes for public health, for example. A one word reply to your really thought through post: YIKES! You’re right, science IS overrated. Actually, you are very, very wrong in that. In fact, the package insert of every medication out there does break down everything in the drug, including a molecule diagram, Ask your pharmacist for the packaging insert next time you buy a med. The problem with the placebo effect is that there is no real improvement and it simply encourages ignorance and attention seeking behavior. It is simply irresponsible to legitimize every single false complaint out there. Also, look at the number of lawsuits filed by people who sought out so-called “alternative healing.” People DIE because of the placebo effect. Wow buddy you are really acting silly, next thing we are going to have unhealthy things sold as healthy things.. Unless there is truth in the matter don’t advertise it as such! I appreciate that, but I’d rather not say which store it was. I’m impressed with their response and want to point it out as a positive example, but as they didn’t give me permission to quote them directly in my article I also chose not to name the business. I’d have been happy to share which store it was otherwise though. Mark I just want to say thank you for doing this. I live in Los Angeles where you can pretty much throw a stone and hit a “psychic” a “crystal healer” or a “reiki healer” or a tarot card reader or some nonsense. There is this one – shall we say “vortex” of horribleness called “The House of Intuition” where they actually sucker people into taking classes for hundreds of dollars on how to heal with crystals and read tarot cards and other awful things that are all about making MORE liars and charlatans… can you please comment if threatening action with the ASA could really shut them down? Or can they just get out of it like a church and call it “donations”? I think you handled the copper healing very well. at a local art show. I would LOVE to see this taken on. I spent many years camping up in Oak Creek Canyon, and Sedona has so much Real magic it pissed me off when people were always trying to act like there needed to be something supernatural on top of how super it is naturally. Just yesterday a friend on facebook posted pictures of Sedona and was calling it this vortex and that vortex and they were serious… it’s so annoying.. Since I’ve used some homeopathy options for my own health with great results, combined with the fact I’m a scientist, I find this sort of thing rather fascinating. And, since I apparently have nothing better to do on a cold Saturday afternoon, I did a little research with scholar.google.com. There is medical evidence that copper is a beneficial addition to existing anti-inflammatory drugs, which help with joint pain: http://www.sciencedirect.com/science/article/pii/S0010854502000863 There’s *probably* research that also backs the other health benefits of copper. However, as with the journal article above, I’m willing to bet that, if there *is* research that backs the claims, it is about the oral ingestion of copper. I wouldn’t think amount of copper a person is likely to absorb through the skin from a small bracelet is likely to have any effect, but I’m not completely sure. Here’s an article that I’m betting has some data about copper, its absorption through the skin and its effects: http://informahealthcare.com/doi/abs/10.3109/10408449309117116. They studied 31 metals, so I’d think copper would be one but, honestly, I didn’t want to buy it, just for this. So the absorption conclusion is a bit of speculation on my part. As far as the magnets are concerned, here is an article that indicates magnetic insoles are beneficial for diabetic patients with foot pain: http://www.sciencedirect.com/science/article/pii/S0003999303001060 But, the magnets used in the insoles, at 450 Gauss, are significantly bigger than those in these bracelets. This is important since the strength of the magnet it related to its size. A tiny 1/4″ magnet, even if rare earth, just isn’t going to have that much effect. Also, the article talks about the magnets working on the nerves, not the iron in the blood. Here’s an article that debunks the magnet-blood flow claim: http://www.jospt.org/doi/abs/10.2519/jospt.2002.32.10.518#.VHDknWOOqKI. So, there *is* the possibility that *some* of the claims they state have *some* truth. There is very, very little possibility (I’d say none) that all of them are true or that these bracelets will replicate the results of those that are. It’s like saying that, since manure is shown to increase garden production, burying cup of rabbit pellets in a cardboard box in a corner of the garden is all you need to increase your garden’s production as well as attract fairies. Pseudoscience at its best. In other words, the claims are bs, including the homeopathic bs. I opened this url ahead of breakfast so I could have some entertaining reading with my morning coffee. I’ve got to say, that is not the outcome I was expecting and now I feel a little underwhelmed. Ha! :) Very good to see a rational reaction by the store. That’s awesome of you! I had an issue with green earth before because they were selling plastic spacers for stretching and that’s not recommended because it’s porous and can creates a greater risk of infect. They were so adamant despite the opinions of all the piercers in town. Scumbag sales people. I even had a guy sell me the wrong size and say it was my fault and there’s no refunds. I literally had to e-mail the chain and when I returned them the manager was there making sure everything was done right and that I couldn’t buy anything else. That was my teenage rebellion and my ears are back to normal now but the gall of that store has made me never shop there again even when I want other things they sell. I don’t need convincing that the benefits of that kind of product are nil or negligible but I do need convincing it was ‘necessary’ for you to threaten a formal complaint to a higher authority. Couldn’t you just not have bought the items? I’d rather live in a society where things are sold by means of dubious claims and I have to use my judgment when shopping than in one subject to the tensions created by zealotry of this sort. After all, many commodities, if not most, are sold by exaggeration, from improbably effective cleaning products to the endorsements on the covers of books (“If you liked ‘Little Red Riding Hood’ you’ll LOVE Stephen King’s ‘Carrie’!”, etc.). This is an effect of our culture. I hope you’re being consistent and coming down on all false advertising, not just targeting pseudo-science. Patrick, I hope you’d agree that people have the right to make informed choices about their healthcare. If you like to thoroughly investigate every claim you encounter before making a purchase then good for you. However, not everyone has the time or motivation to do that, nor should they be expected to. When people are misinformed about medical information, their right to make an informed choice is being violated. There’s good reason why many countries, including my own, have laws in place to prevent misleading claims from being made in advertising. Medical claims are often subject to even more scrutiny due to the potential for harm that comes with misleading medical information. However, regulatory frameworks are often slow and, due to limited resources, may not be interested in smaller cases such as this. I’m glad we have an effective system of voluntary self-regulation here in New Zealand with the Advertising Standards Authority. There are a lot of misleading claims out there, and I can’t possibly take them all on. It’s misleading medical claims that bother me the most, so they’re the ones I generally try to do something about. I’ve seen enough comments on Facebook just today about how I must have way too much time on my hands, when I probably spent less than an hour in total on this complaint. I’d hate to think what I’d see if I went after every misleading advertising claim, as you seem to think I should. Depending on a statist higher authority, as we do in this country, is outright pernicious and wrong. Having a privatized one providing information and perhaps some sort of effective pressure to curtail said bs would be better, but we as a people are too lazy, ignorant and cowardly to be free from a maternalistic and interventionistic state. Thanks for this post, just discovered you blog today through a friend. You’ve got a good head on your shoulders have you seen a show called ‘the checkout’? its by the chaser guys but its about australian advertising standards and what not, I think you’d make a great part of the team and this blog would prove that to them. Thanks Jaunay, I love The Checkout! I discovered it after Kylie Sturgess interviewed Julian Morrow on the Token Skeptic podcast and subsequently binged on their episodes on YouTube. I think they do a great job. We have a long running Consumer Affairs TV show here in New Zealand called Fair Go, but it has quite a different feel to The Checkout. You have WAY to much time on your hands to be letting this concern and take up you energy. Get a life! YOU have to much time on your hands, determining that others have too much time on their hands and taking the time to inform them of your unbiased opinion of how they spend their spare time. i would like some sauce on the negative evidence for copper, … i’ll just leave this here..
A 1983 study by P. Kuhn measured bacteria levels on brass and stainless steel doorknobs in a hospital. Results confirmed that the brass doorknob exhibited almost no microbial growth, while the stainless steel doorknob was heavily contaminated. Two decades later, these observations spurred in-depth and scientifically controlled studies using test protocols specified by the U.S. Environ­mental Protection Agency (EPA) to quantify the antimicrobial property of copper and copper alloys. Any topical antiseptic properties attributable to copper seem rather irrelevant here, considering that the claims being made regard relieving pain, stiffness, and fatigue. 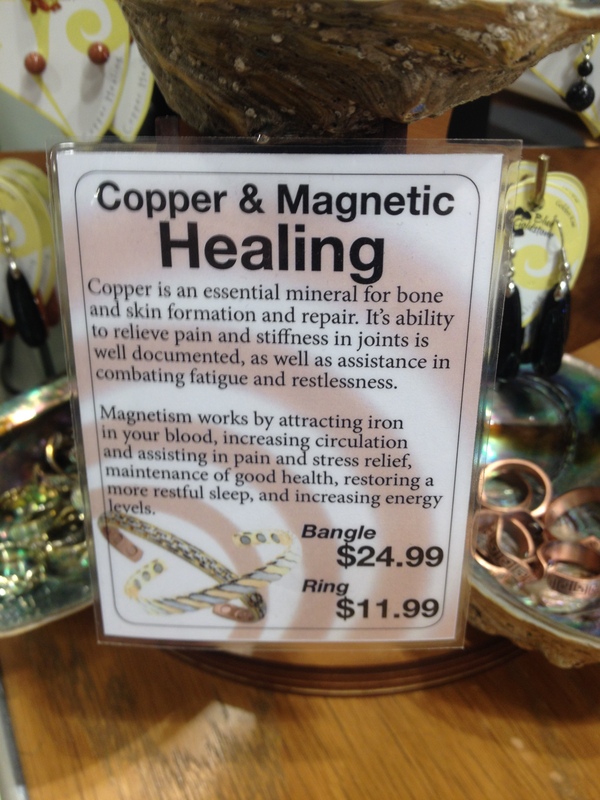 If you’d like to read more, Steve Novella wrote a post about Copper and Magnetic Bracelets for Arthritis for the Science-Based Medicine blog in 2009 which discusses the sources I used. Wow, that is the most mature, responsible, method I have ever heard of a company responding to a polite, informed, complaint. I believe the most common response is something like ‘open your eyes to the truth sheeple’ or ‘you are simply a tool that has been deceived by Big Pharma.’ If I had an experience like this, I would definitely support that business.